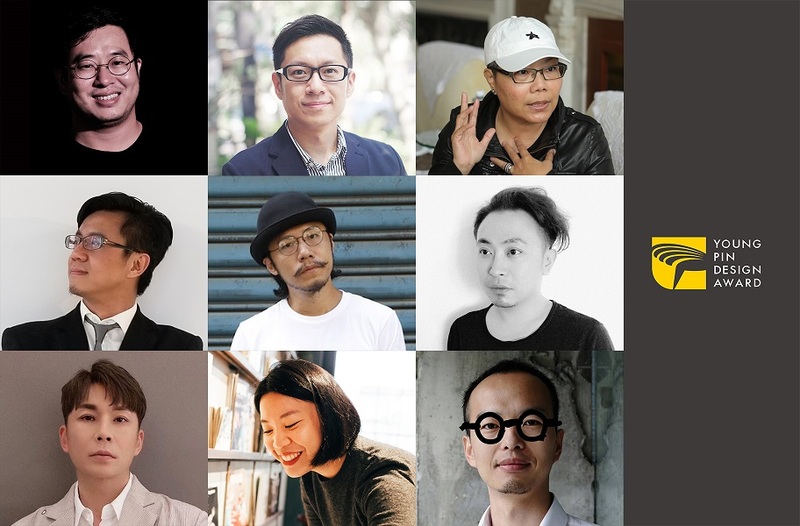 On March 4, the Young Pin Design Award announced the complete list of jurors for the 2019 edition. This edition includes the new category of “Social Design,” and the “Special Entrepreneurial Potential Award” will continue to be conferred. In the “Digital Multimedia” category, the number of jurors was increased. For the first time, it has assembled 49 designers, media people, and market trend experts from various fields to serve as the jury. Together, they will identify the next generation of design talents in Taiwan. The Young Pin Design Award utilizes a jury convener system. Each of the eight award categories and the “Special Entrepreneurial Potential Award” has its own convener. The conveners are responsible for appointing the jurors, and together they will select the award-winning works. This year, the number of jurors for the “Digital Multimedia” category, which covers an extensive scope, was increased to nine. “Digital Multimedia” convener and new media artist Cowper Wang says the need for integrated thinking has increased as the diversity of communication channels and vehicles increases. He therefore specially recruited eight professionals with ample experience across different fields, including static/motion graphic design expert and cutting-edge director Tu Hao-chin; fundraising consultant and expert Tahan Lin; and 2018 Taichung World Flora Exposition “Phototrophic Synthesia” designer and Ultra Combos Co. director Jay Tseng. They will select winners through multiple perspectives, including narrative creativity, visual expression, brand marketing, digital technology, and interactive relationships. Agua Chou is the convener of the new category “Social Design.” She says the selection criteria for this category will not only be applied to the works themselves, but also to the proposed suggestions of designers for social issues or systems. She invited National Chiao Tung University Graduate Institute of Architecture assistant professor and environmental aesthetics expert Tien Ling; REnato Lab chief operating officer and promoter of Taiwan’s circular economy development Aining Ouyang; and service designer and social issue analyst and strategist Takeshi Lin to serve as jurors. She also recruited Han Wu, design director of the 2018 Taichung World Flora Exposition and CEO of World Design Capital Taipei 2016, to help identify talented designers with potential and a passion for social design. Convener Effie Huang considered the ever-expanding definition of spatial design when forming her jury for the “Spatial Design” category. She therefore recruited spatial design experts with cross-disciplinary experience in curating, art creation, and other fields to serve as jurors. They include Wooyo Co. partner Hom Liou, whose curatorial design of “Ink Now” at the 2019 Taipei Art Expo has garnered a lot of attention as of late and whose work “Hillside House” won the 2018 Best of Golden Pin Design Award. He will also serve as the curator of this year’s “Young Designers’ Exhibition,” helping the next generation of designers to display their creativity. In the “Packaging Design” category, convener Liao Jun-yu (Godkidlla) invited packaging design expert, award winner, and Joe Fang Studio creative director Joe Fang to serve as a juror. Fang previously created the album designs of numerous performing artists and groups including A-Mei, Jam Hsiao, and Frandé, and served as the visual director of the 54th and 55th editions of the Golden Horse Awards. He is also extremely influential among students. “Craft Design” convener Gina Hsu said she believes crafts are about bringing more beautiful visualizations into people’s lives. She therefore specially recruited designer and cultural observer Wu Tung-lung to serve on her jury, hoping his exquisite and original vision will lend a helping hand to the selection process. In the “Fashion Design” category, convener Florence Lu invited renowned stylist Sun Hua Chen to serve as a juror. Chen has over 25 years of experience as a stylist, and has worked with many top performing artists. He organized two editions of the “Big Shot Charity Photo Exhibition,” and frequently works alongside cutting-edge designers and craftsmen in cross-disciplinary collaborations. Yu Feng, convener of the “Visual Communication” category, recruited jurors from numerous disciplines, including design, advertising, the cultural and creative industry, and media design. The jurors include well-known industry figures such as United Advertising executive creative director Kevin Huang and “Shopping Design” deputy editor-in-chief Marianne Pao. Feng hopes their expertise will enrich the selection process. Meanwhile, “Special Entrepreneurial Potential Award” convener Kevin Ho enlisted IMA Cultural and Creative Office chief executive Marlene Ma, an expert in advertising and the cultural and creative industry, to serve as a juror. He hopes she will be able to use her brand management perspective to identify the next ventures that are brimming with entrepreneurial potential. PreviousNext project:The 2019 YPDA Opens for Submissions with Addition of Social Design CategoryNextPrevious project:List of 822 finalists for the 2019 Young Pin Design Award is announced!